I have taken upon myself to both develop a portal, in addition to marketing it as my project. I have already a degree in computer science, and decided to combine this with my current bachelor study in export marketing. The "export" element is in having an international target. The portal is not limited to any country or continent, but is suppose to be for everyone. So it will initially be made in English, the most globally accepted language – with multilanguage support in mind, for easy translations in the future. The "marketing" element lies in my attempts to promote this portal, and to stimulate people into participating in its future development. My hope for the future is not of commercial nature, but to see this portal becoming a community effort. So that it will become an equality to the Linux community. A big effort and time consume lies in the development part alone, since programming in general takes a lot of time. Adding one small feature or even just fixing one bug can take many days. Compared to how much one can write in a report during the same time, it become apparent that the report will not be as comprehensive as other reports where most of the work is put into writing the report. When comparing with other portals like Yahoo!, that has been around since 1995 with 50 employees and now employ almost 8000 people – it is clear that creating a portal is not easy, and takes a lot of time. The reason why we might actually catch up, is because we will use already existing open source projects – some with years of development – and integrate those into our portal. Google is also considered a portal by many people, even though they mainly just have search. But that is also what many people use Internet for – to find information. So I have put a lot of work into making the search work smoothly, and such the main element of the portal is in place. Many people also expect news and weather from a portal, so that have been added as well. In the future a lot more will be added, but my focus have so far been on the basic elements. The portal has been created with a clear and simple design in mind, so that everyone will quickly understand and like the layout. I believe the clean and fast design of Google is one of the main reasons for their popularity. As oppose to their competitors, their advertisements are not disturbing, given higher priority or getting in way of the content. Their use of graphics is kept to a minimum, and they have a lot of "air" (white space) that gives space for breathing. They let users quickly find what they are looking for, without the usual extras that can be found on most other sites. They don’t do the common mistake of stuffing the limited space available with too much information so that the layout becomes messy. The portal will have two main designs called Basic and Advanced. Basic will be the default design, and contain basic functionality. To enable the advanced view to be displayed by default, one has to create an account. By having one account, the settings will be stored in the profile and remembered for future visits. When a city is entered in your profile, your weather forecast will also be shown when one visits the portal. The main concept with the portal have been to make it as personalized as possible, so that you will see the portal in your language, with news from your local-area, weather forecast and a place to keep in contact with your friends and others with similar interests. Basically to be presented information you care about! Most of the personalizing is done when filling out information about yourself in your profile, but also when you change your settings. Like if you prefer to see a 10 day weather forecast, instead of the default 7 days. News presented on the front page of the portal will be based on the interests that are listed in your profile, and your geographical location. Most portals have a category with Internet sites of interest in various subcategories. This do we have as well, and it is possible to search the category too. This is part of our search site Dexti.com where one simply might write “Dexti.com/Lucid Dreaming FAQ” to find FAQs concerning Lucid Dreaming. With such a specified set of keywords will the page presented show the two FAQs on the subject that exist among the 8 billion pages that are indexed. Being able to write the keywords so easy in the URL is an advancement compared to the existing systems in other search sites (except a9.com). Image search have also been integrated, and we are continuously adding more sources. Search is currently powered by Google, but we will shortly replace that with search results from Majestic-12, a distributed search engine with the potential of becoming better than Google. Results that is provided to us for free. Visiting News.Dexti.com will present the most important news stories in various categories, and it is also possible to search for news stories. We plan big changes for this part of the portal, giving users a chance to write their own news in their native language – and a discussion board for our users to exchange their opinions for each news story, with a user moderated system. Visiting es.News.Dexti.com will present news in Spanish, and many other languages are supported. 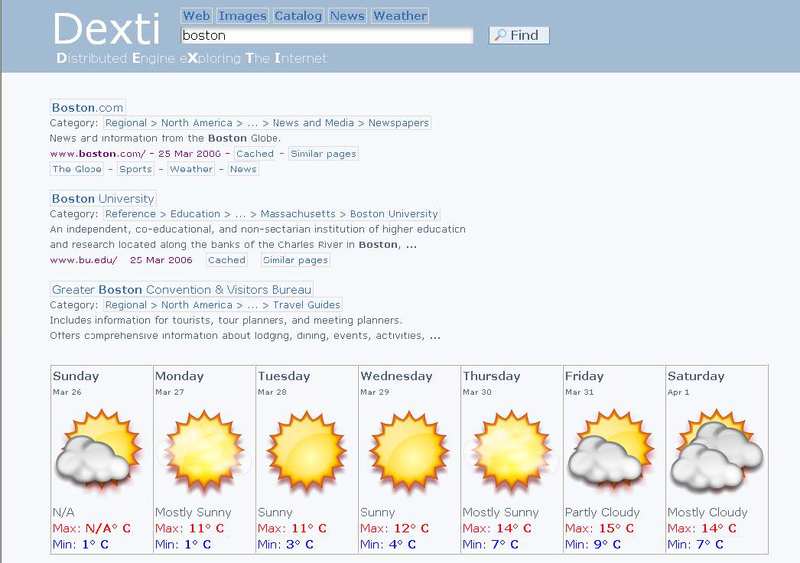 For getting weather forecast for Tromsø (in Norway), one can write either Tromsø.Weather.Dexti.com or Weather.Dexti.com/Tromsø – you will be presented the same page giving weather forecast 7 days ahead. In our Weather service have we used skinning technology (also called templates and themes), that allow us to separate programming and design. This has been an important feature because of our two planned templates: Basic Template for the most basic functions and Advanced Template for full customization and full range of available settings. We plan to let people choose which type of weather icons they want (big, small, etc. ), and let people add skins with their own icons for public use. All the technology is in place, but so far we have only made one 3 days forecast weather skin that takes away all unnecessary information for inclusion on other pages. We use this on Dexti.com; for example Frame.Malaga.Weather.Dexti.com will display this skin. We will add satellite photos, and weather history as well. And upgrade the whole system to support 2 million places around the world. Here will people be able to add whatever they are interested to have on their start page. Text Search, Image Search and News search are easily available from the Portal as well – and as we get more domains up and running, we will also add blocks to the start page that people might add if they want. For instance the 3 last threads in a forum, 3 last emails received or awaiting Instant Messages. Using Internet as a marketing medium is a fairly new phenomenon that is opening a new world of opportunities. An interesting part of using Internet is that one can create a service and make it available for free – if it is a good product the word will travel fast on Internet, and within a short time one can have become the leading service provider (still without spending anything on marketing). And that is the secret for success on Internet, to supply a good product – and the rest will fall into place by itself. Especially if one supplies something that is superior to its competition, or providing something original. Changing start page, adding and deleting links takes only a second. I know that most people that are writing a report are doing so with some research as a basis, and they base further research and the following analyzing on well-established theories – filling the report with references. That is the scientific way of doing it. But I don’t consider this report to be a research report, and such – it will not be based upon other people’s previous research. I have used Internet daily almost since it was born, since 1995 when Netscape 1.0 was the dominant browser. So I have been carefully following the development of Internet and learned to understand the factors for success. I have many real-life examples to back up my understanding, and I will present some of them in this report. I could of course find other authors that have similar understanding like me, but I prefer to spend my time better by explaining my reasoning. Many students usually start examining a topic they don’t fully understand, but achieve this knowledge through reading articles written on the same subject. I, on the other hand, having worked with web projects since I was 16 years old – feel qualified enough to write this myself without having to refer to other peoples work. But also because the low amount of material on the subject, and the literature I would be able to find would most likely be directed towards commercial web sites. Google is one of the best example on how to succeed on the Internet. They have been in business since 1999, and grew to become the largest search engine already within one year. It started with two graduate students at Stanford University that saw a business potential with their search technology. They had initially no plans for starting a corporation, but when they had problems finding partners -even during the big dotcom wave, the only solution seemed to establish a corporation with venture money. They only got $ 100 000 at first, but later managed to secure $ 25 million from the two biggest venture companies in Silicon Valley. The future were secured, especially as various Portals agreed to include Google search and the introduction of advertising really gave a boost to their revenue. Even today, while MSN search and Yahoo! search give more or less the same results, Google is still the preferred search engine. Yahoo! might actually give more relevant results in many cases, but that is a bit too late now. They are all equally fast too. Google still offer superior quality, with less commercials and also by being less intrusive. (Though, their ads have become increasingly more intrusive the last few years.) They also have the largest index. And because Google was the first engine with relevant and accurate results, it will take a lot more than slightly more relevant results for people to bother with a change of search engine. People are happy with Google, it finds what they want and they like the low amount of commercials. Google is predicted to keep their position even though their competitors are closing in, because it is not expected that their competitors will be able to offer a much better service – and for that reason the users won’t see any reasons to bother with making the switch. There are those who don’t know much about computers, nor Internet – many are in this situation that usually choose whatever is default, and are happy with having basic functionality like e-mail, chat and Web. They accept almost everything as long as it’s free, satisfy their communication needs and give information/news of interest. These users have difficulties remembering domain names often because they don’t fully understand the logic of Internet, so portals with integrated solutions are more successful towards this usergroup - since there is no need to enter more than one URL. The best examples here are Yahoo!, AOL and MSN. E-mail, chat, news and search are all integrated in one solution for fast and easy access. We call this group "late adapters", they follow the majority and usually don’t change until close friends recommend something else. They don’t care about quality and functionality that exceeds basic needs, nice graphics and design can actually be more important than some basic functions. As long as they can communicate with their friends, nothing else matters. These people don’t spend much time on the Internet, they have most likely got help to do the few things they know on the Internet, they are unaware about the alternatives and doing anything by themselves are considered difficult or impossible. At least they don’t have enough faith in themselves to even try, especially if they have something that is already working. They’re just happy because it is working, and they are able to communicate with their friends – you can be sure they have had their share of computer problems, and have needed help from experts in the past. They have a great fear for damaging something, and they’re afraid of experimenting or even trying something new for this reason. This group is of no interest to us since they don’t do something new without someone proficient in computers present. It is those proficient in computers, the people with the know-how that set the standard for what is hot or not. So in order to market something on the Internet, you have to catch the interest of these early adopters. Stanford University Professor Everett M. Rogers formalized in 1962 a theory he called “Diffusion of innovations”, a social science theory that explain how and why new ideas spread through cultures. Rogers stated that adopters of any new innovation or idea could be categorized as innovators (2.5%), early adopters (13.5%), early majority (34%), late majority (34%) and laggards (16%). The percentages occupied by these five types are shown by the bell-shaped curve in the graph below. Rogers compared this curve to the S-shaped curve formed by cumulative frequency distribution of product diffusion and, based on the fact that the 16% line that marks the cut-off point between innovators and early adapters and other consumers roughly coincides with the point where the S-curve starts to increase dramatically, discovered that the key to product diffusion is diffusion amongst opinion leaders (early adopters). Thus Rogers put forward the 16% diffusion rate theory. Early adopters are a part of the integrated local social system, more than innovators are. Whereas innovators are cosmopolites, early adopters are localities. This adopter category, more than any other, has the greatest degree of opinion leadership in most social systems. Potential adopters look to early adopters for advice and information about the innovation. The early adopter is considered by many as the "individual to check with" before using a new idea. This adopter category is generally sought by change agents to be a local missionary for speeding the diffusion process. Because early adopters are not too far ahead of the average individual in innovativeness, they serve as a role model for many other members of a social system. The early adopter is respected by his or her peers, and is the embodiment of successful and discrete use of new ideas. And the early adopters that continue to earn this esteem of colleagues and to maintain a central position in the communication structure of the system, he or she must make judicious innovation decisions. So the role of the early adopter is to decrease uncertainty about a new idea by adopting it, and then conveying a subjective evaluation of the innovation to near-peers by means of interpersonal networks. The diffusion of innovations curve (innovation adoption curve) is useful for understanding that trying to quickly and massively convince the mass of something new is useless. It makes more sense in these circumstances to start with convincing innovators and early adopters first. Also the categories and percentages can be used as a first draft to estimate target groups for communication purposes. Figure 1 show in addition to the five categories of adoption, a 16% diffusion rate line. That is where diffusion starts to take off. This line is also called "The Chasm" (see figure 2). A term that was introduced by Geoffrey Moore in his book "Crossing the Chasm" from 1991. The Chasm marks the transition point before any invention or idea really starts hitting the masses at a tremendous speed. This is where the new product reaches a mature level, so that it is not only reserved for technology freaks – but also people wanting solutions and convenience. Donald A. Norman wrote in his book "The Invisible Computer" from 1998 that the Chasm mark where technology satisfies basic needs. Quality becomes good enough, and there is a transition in demand from more features and better performance, to consumers demanding convenience, ease of use, reliability, low-cost and integrated solutions. A common mistake is to create something so simple that only the early adopters and visionaries get more annoyed by what the service lacks instead of appreciating what it offer. So it is extremely important to satisfy this group for it to have any chance of reaching the majority. Innovators, technology enthusiasts, opinion leaders and early adopters have one thing in common, they are all visionaries. They are curious and interested in the future with a focus on technology. They are especially interested in new technology, solutions and standards that have far-reaching potential. They have, like me, a lot of experience in the field of technology, and have very clear idea for what they like and why. They have as with everyone else different taste and preference, but it is usually people with high education – so when something is technologically superior, then they all agree and use that. Almost everyone in this category use for instance Google as their primary search engine. Another common factor with these people is the need for exploring the potential. Freedom to do _exactly_ what they want, and to be able to customize a service to suit their needs and desires. The more freedom and amount of potential a service offer, the better it tends to be liked. These people use technological solutions a lot and they are always on the outlook for new and better solutions that can make their life easier or improve their life quality in some way. It doesn’t have to be more than finding a way to remove commercials from their favorite technology news site by installing an Ad-blocker in their browser, or even better – change to a different site with similar news and less commercials. Visionaries that work with computers do not only have it as their job, but also as their hobby. They spend a considerable amount of hours with their computers every day, both at work and at home. With years of experience, participating in discussions with others and reading news, they have learned the driving forces and practice of some corporations. Most visionaries have for instance learned about the evil methods of Microsoft, and the antitrust lawsuits they continuously lose. The way Microsoft kills competition and innovation, with their inability to play fair – have disgusted many visionaries. In many cases to such a degree that they refuse to use products from Microsoft, and the rest do not give support by paying for their products. For Microsoft, being so rich as they are, it is still only about money and market share. Their browser has not been updated in the past 4-5 years, and their Internet Explorer development team has been dissolved as well. Since they won the browser war against Netscape, bundling their browser with Windows and constantly releasing new versions – the need (from a commercial viewpoint) for further development seized as they reached more than 95% market share. Microsoft did not make any money on releasing their browser for free, so in a company where everything is about profit – the developers were given other tasks. But the development of Web standards is a continuous process, so Internet Explorer has fallen behind in their support and now cause serve irritations for web developers. They are unable to use the latest web innovations, because of missing support in the most popular browser. With the launch of Firefox, the open-source browser that recently reached 50 million downloads, the market share for Internet Explorer have started to drop down to 80-90%. When Microsoft smells competition, a threat to their strong market position, then they reassemble the development team and aim for being best again. Once again with the intention of using their monopoly position to crush competition. This time they cannot compete on price, and the collective effort of the open-source community would be able to keep up the pace in development. Visionaries are to various degree idealists that support solutions that give freedom, encourage innovation, continued development and interoperability through open standards. Especially solutions that are set to life in a dynamic and flexible environment, with priority given to other values than those of commercial nature. So why is the dislike towards close standards a growing phenomenon? I think the right question is what motivation lies behind using closed standards. Yes, for commercial reasons of course. One example is Microsoft’s development of their Instant Messaging software. As usual they started many years after the phenomena became popular, when ICQ were most popular. Bundling it with Windows eventually made their Messenger dominating. Microsoft also bought Hotmail as their popularity grew, only to make the service worse with more commercials and less storage space. Actually as little as 2 MB, barely enough for one digital picture. Compared with Google’s Gmail is that only less than 1 / 1000 of what Gmail offer with their 2700 MB, adding approximately 2 MB every day. I know those that have five Hotmail accounts to get enough space for their e-mails, when one Gmail account let you keep all your e-mails for the rest of your life. The case here is that Microsoft forces their users to use Hotmail for sending messages to friends not currently online in their Messenger service, increasing their advertising revenue. Being able to send off-line messages is a clear advantage for the user, which can be done in seconds – while sending an e-mail might take more than a minute. Microsoft said under the launch of their new Xbox 360 that their online gaming system Xbox Live will include support for sending off-line messages. Again a clear example that it is not that they cannot do it, it is simply because they would loose money adding this feature to their Instant Messaging system. Another consequence of using closed standards is the inability to communicate with other Instant Messaging services like ICQ, Yahoo Messenger, AOL Messenger and Jabber. Many are forced to install multiple messaging programs because they have friends on multiple networks. This is true for most people that have used Internet actively during the past five years, and I am no exception. My friends are spread on three networks. But luckily there are open standards in development, so we will include this feature in our future e-mail service and offer a better integrated service than what Microsoft have done so far. The big commercial companies are in it for the money, and such are unable to preserve what is in the best interest for their users. The open-source community is doing a far better job here, but the cost in hosting and bandwidth gets too high for most people to offer it as a service without any form of income. So it is easy to understand why open source have gained so much popularity among visionaries. Many of those who have programming as their living, work with commercial solutions at work and open source solutions at home. They are struggling to find a balance with their ideals, and still be able to make a living on it. One problem in the open-source community is that the development sometimes become unstable, with change of developers or even projects being abandoned, due to getting bored, receiving too little interest or simply becoming too busy with other things like work or family. But if the project is good and popular enough, there’s always someone ready to continue running with the stick, and pass it on to others if necessary – this is why clean coding style with many comments is so important in the open-source community. If we compare open-source with the development of Internet Explorer, then it is safe to say that open-source development is far more stable. Even though many were unhappy with the lack of features, and the amount of security flaws in Internet Explorer – they still used it, just because there where few good alternatives. One can use Opera, but that is not a free browser – so either one pay, or learn to live with the commercials. With the release of Firefox, people were giving a free alternative without commercials – something many people had been waiting for. Open-source is here to stay, the visionaries will make sure of that. Just because they put the emphasis on the user experience quality, something a commercial model never will be able to do in the same extent – simply because paying for something in itself, either directly or indirectly through commercials, drastically reduce the experience. We don’t have a problem paying for a computer, though we prefer paying as little as possible or at least get value for our money. To pay a little extra to get Windows preinstalled on the computer is okay as well, and we can even pay for necessary software like office programs as long as the price is fair. We can even pay for upgrades, if there have been huge changes. But all this is changing now, future upgrades will be of minor importance and we will prefer playing games on consoles like Xbox360 and PS3 – so the big need for upgrading your computer will also fade with time. The industry knows this, so they are already working on a different business model where people subscribe to software instead of a one-time purchase. A move the market will dislike and cause them to look for alternatives. With free open-source software not far behind, the choice will be clear. Making money on selling software will be difficult in the future, since there will exist an open-source alternative in every category. Willingness to pay for software will see a drastic fall in the years to come, even in the realm of business. Making money though installation and support will become the only choice, but the competition will be hard. Visionaries care about value for money, bust most of all what is best; if they believe for instance Firefox to be better than Internet Explorer – then they will use that instead, and of course recommend it to others. Visionaries will for instance also change to Linux at the same moment as it becomes a better alternative to Windows, that is – when changing are solving more problems than it are creating. For many is that true already. Most of them have made this change from other webmail accounts like Hotmail, to the new webmail from Google called Gmail. Even though Gmail is still invite only, the communication between visionaries is so good that those who have wanted an account, already have one. The reason why they choose Gmail, is simply because it is the best free alternative out there. Visionaries don’t like to feel stupid, they are proud with a high self-esteem. So using a bad solution, or even second-best makes them feel stupid – unless they can give very good reasons for their choice. By being best one initially attracts this huge group, this respected group that the majority gets their tips from. The majority doesn’t do much before consulting with this group first, and with enough warm recommendations – they might even feel confident enough to recommend something to fellow members in the majority group. As we start getting the basics into place, we will focus more on the personalized and customizable part. For instance will Cadiz.Andalucia.es.News.Dexti.com be the portal for their region Cadiz in the southwest of Spain. To get the city Cadiz, one has to write Cadiz twice. We even have support for international characters, so that this will be possible: Ålesund.Møre_og_Romsdal.Noreg.News.Dexti.com/SearchString. SearchString can be replaced with a desired keyword if one wants to do a search in the news for that city. There will also exist short versions like AES.MR.NO.Dexti.com. AES is the airport code, and Dexti.com will be the main portal domain, so this site will not only show the latest news – but also whether, events and area, headlines from local forums, etc. this will just be limited to cities and places, but also people belonging to a certain group – like the student building in Ålesund. Then they just create a subdomain under the city, and voilà! – their own web site with everything included. So that they can publish the latest happenings and photos from parties, discuss and chat online – but also invite people to a movie evening, and for instance arrange collective transport to the school. And those wanting a more personal version, can create yet another subdomain using their name or nickname. All these states are interconnected, so that a story can reach a higher subdomain with enough votes – or if it is being added by a moderator. If someone writes a story on the Ålesund subdomain, which can be of interest for the rest of Norway, then it can be shown on Norge.Dexti.com. Every subdomain will now be identified by our system, and we have verified that international characters works. We have also a list of all the places in the world, including small places in Norway, sorted by continent, country and region – with information about coordinates, English name, local name, etc. that allow us to have a loose news exchange with local cities, and we can for instance include water temperature if the city is close to the coastline. We will also get to know our users as good as we can, like monitoring what resolution most people use and adjusted the amount of content based on the resolution being used – for optimal use of their monitor. Today are only 20% using the small resolution at 800 x 600, and because of this are most portals today using a fixed width at 800 – causing an unnecessary amount of white space for most people, a solution that is far from an optimal one. Around 60% use the 1024 x 768 resolution, they will see this white space – but it is within acceptable levels. The use of resolutions above this level is a growing phenomenon, especially with increased popularity regarding widescreen monitors. The new high-definition televisions can for instance have a resolution like 1280 x 720, which is a 16:9 format (widescreen) that would be 1280 x 1024 on a normal monitor. This means that we see more on the sides, at the same time as we see less in the height. So on a web site with a fixed width of 800, and a height at 720 – you will find yourselves using the scroll button all the time! On my laptop do I have a 1400 x 1050 resolution that cause a white area on almost half of my monitor! And there are many people with the more common 1600 x 1200 resolution. Because of this do most web sites have a great potential for improvements. In this report have I established which segment that we have to direct our focus, targeting the visionaries and trendsetters on the Internet – and then the rest will eventually follow. We want to do this by offering them all that they want, freedom to contribute, participate, modify, moderate and customize exactly the way they like it. If they don’t like one of our many customizable layouts and settings, then they can create their own skin and write add-ons. Ultimately will we be able to offer every service currently available on the Internet, with the goal of delivering the best user experience. We intent to achieve this by creating a portal that share the same basic design in all its parts and keep them interconnected for easy navigation. We will gain many synergy effects by offering so many services under one system, like reduced loading time and the desired Single Sign-On system that will enable our users to only need one e-mail, and one password. This will be based on an open standard to ensure full compatibility with other systems. The email address will also be used for Instant Messaging, and our users will be able to add their existing IM contact so that they only need one IM program. An important factor for our current generation growing up, since Instant Messaging has actually become more popular than e-mail. So how will we actually market this portal? That is the best part, as long as we deliver premium quality – then the portal will market itself, our users will make sure of that. So we only need to focus our efforts in developing services that give our users the best quality experience. There is a phenomenon called /.-ed (slashdotted), which happen when a service of public interest is being published by a contributor. This is maybe the most read technology news site with the slogan: "news for nerds, news that matter." Having a story written about your site on Slashdot.org will drive so much traffic to your site that it might choke from all the requests! When something of general interest is published there, all the technology news sites around the globe will also write their own story in their native language. People visiting this site will make a bookmark if they like the site, and become a returning visitor if it is better than their existing solutions. Or maybe even remember the domain if it is easy enough, like our search site Search.Dexti.com, where you go to find information on the Internet. There has been made a new domain called .name, that is suppose to be used for e-mails – so that if you’re called John Clark, you can register the e-mail John@Clark.name. We have the domain Dexti.name, so that when we get our mail service up and running then he can register John.Clark@Dexti.name for free instead. The community is increasingly becoming more conscious about what they like and want. Revealing this community effort Portal will put the missing piece in the big puzzle, and many will recognize this when they visit the portal and get to learn about the philosophy behind it. Search among more than 40 000 places around the globe, predicting the weather one week ahead. Our news site, powered by Google. Please note that the portal is an early alpha development stage, and we are far from ready for a public release. And such, I ask to keep it private until we become so pleased with our efforts that we release a beta for public testing. With our strict quality criteria and control, it might take some time – especially since I am currently the sole developer, except some hour’s effort by my girlfriend. I devoted first half of 2005 to develop this portal, to give wind to the dream portal I have been planning for many years – so I will soon discover if my success calculations have been correct! Moore, G. A. (1991). 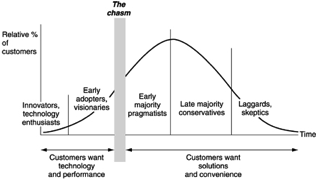 Crossing the chasm: Marketing and selling high-tech goods to mainstream customers. Rogers, E. M. (1995). 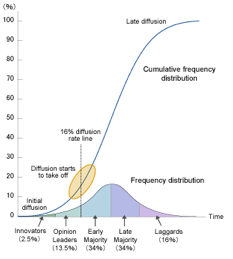 Diffusion of innovations, Fourth edition. New York: The Free Press. Norman, D. A. (1998). The invisible computer: Why Good Products Can Fail, the Personal Computer Is So Complex, and Information Appliances Are the Solution.